The articles published in Immunome Research have been cited 1250 times by eminent researchers all around the world. 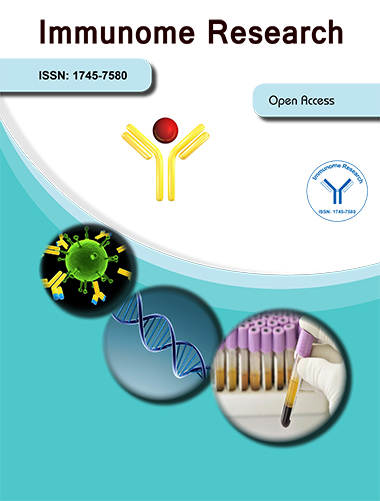 Following is the list of articles that have cited the articles published in Immunome Research. Sieker F, May A, Zacharias M. (2009) Predicting affinity and specificity of antigenic peptide binding to major histocompatibility class I molecules. Current Protein and Peptide Science 10: 286-296. Dimitrov I, Garnev P, Flower DR, Doytchinova I. (2010) EpiTOP—a proteochemometric tool for MHC class II binding prediction. Bioinformatics 26: 2066-2068. Chang HT, Liu CH, Pai TW. (2008) Estimation and extraction of B-cell linear epitopes predicted by mathematical morphology approaches. J Mol Recognit 21: 431-441. Tong JC, Kong L, Tan TW, Ranganathan S. Mpid-t. (2006) Applied bioinformatics 5: 111-114. Samarghitean C, Väliaho J, Vihinen M. (2007) IDR knowledge base for primary immunodeficiencies. Immunome research 3: 6. Dimitrov I, Garnev P, Flower DR, Doytchinova I. Peptide binding to the HLA-DRB1 supertype: a proteochemometrics analysis. European journal of medicinal chemistry 45: 236-243. Karpenko O, Huang L, Dai Y. (2008) A probabilistic meta-predictor for the MHC class II binding peptides. Immunogenetics 60: 25-36. Tsurui H, Takahashi T. (2007) Prediction of T-cell epitope. Journal of pharmacological sciences 105: 299-316. DiezâRivero CM, Chenlo B, Zuluaga P, Reche PA. (2010) Quantitative modeling of peptide binding to TAP using support vector machine. Proteins: Structure, Function, and Bioinformatics 78: 63-72. Bahara NH, Tye GJ, Choong YS, Ong EB, Ismail A, et al. (2013) Phage display antibodies for diagnostic applications. Biologicals 41: 209-216. Miller KR, Koide A, Leung B, Fitzsimmons J, Yoder B, et al. (2012) T cell receptor-like recognition of tumor in vivo by synthetic antibody fragment. PloS one 7: e43746. O'Brien C, Flower DR, Feighery C. (2008) Peptide length significantly influences in vitro affinity for MHC class II molecules. Immunome research 4: 6. Salimi N, Fleri W, Peters B, Sette A. (2010) Design and utilization of epitope-based databases and predictive tools. Immunogenetics 62: 185-196. Magnan CN, Zeller M, Kayala MA, Vigil A, Randall A, et al. (2010) High-throughput prediction of protein antigenicity using protein microarray data. Bioinformatics 26: 2936-2943. Doytchinova IA, Flower DR. (2006) Class I T-cell epitope prediction: improvements using a combination of proteasome cleavage, TAP affinity, and MHC binding. Molecular immunology 43: 2037-2044. Zhou P, Tian F, Wu Y, Li Z, Shang Z. (2008) Quantitative sequence-activity model (QSAM): applying QSAR strategy to model and predict bioactivity and function of peptides, proteins and nucleic acids. Current Computer-Aided Drug Design 4: 311-321. Vita R, Vaughan K, Zarebski L, Salimi N, Fleri W, et al. (2006) Curation of complex, context-dependent immunological data. BMC bioinformatics 7: 341. Ansari HR, Flower DR, Raghava GP. (2010) AntigenDB: an immunoinformatics database of pathogen antigens. Nucleic acids research 38: D847-853. Zhang GL, Ansari HR, Bradley P, Cawley GC, Hertz T, et al. Machine learning competition in immunology–Prediction of HLA class I binding peptides.